Not to downplay the importance of a dominant offensive line, or the value of a staunch defense, but quarterback always has been, and always will be, the most important position on the football field. That fact is as true as ever in today’s NFL. It’s the reason why quarterbacks are the highest paid players in the NFL, and it’s also why teams are constantly investing high draft picks in quarterbacks based on nothing more than potential. When it comes to the NFL Draft, fans, media, personnel departments, and coaches are all enamored with the idea of finding the next great quarterback, which is no easy feat. 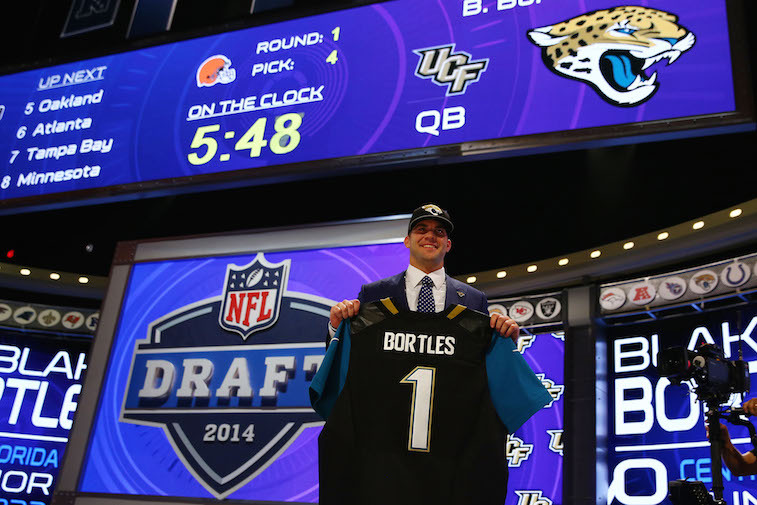 For every can’t-miss, Andrew Luck-type of prospect, there are multiple Blake Bortles-types of prospects – quarterbacks who flash signs of possessing the traits of a franchise quarterback, but for one reason or another, question marks still linger in regards to their NFL potential. The 2015 Draft crop of quarterback prospects is widely viewed as one of the weakest classes of signal-callers in recent memory. Beyond the top-two players at the position, Jameis Winston and Marcus Mariota, it’s anyone’s guess as to the order of how the rest of the group will come off the board during the Draft. There are a handful of guys in the mix to be the third quarterback selected, but up to this point, none of them have done enough to noticeably separate themselves from the others. When it comes down to it, the order that the quarterbacks come off the board this year is going to depend on each team’s personal preference. With that being said, here is a look at the top 5 quarterback prospects in the 2015 NFL Draft. 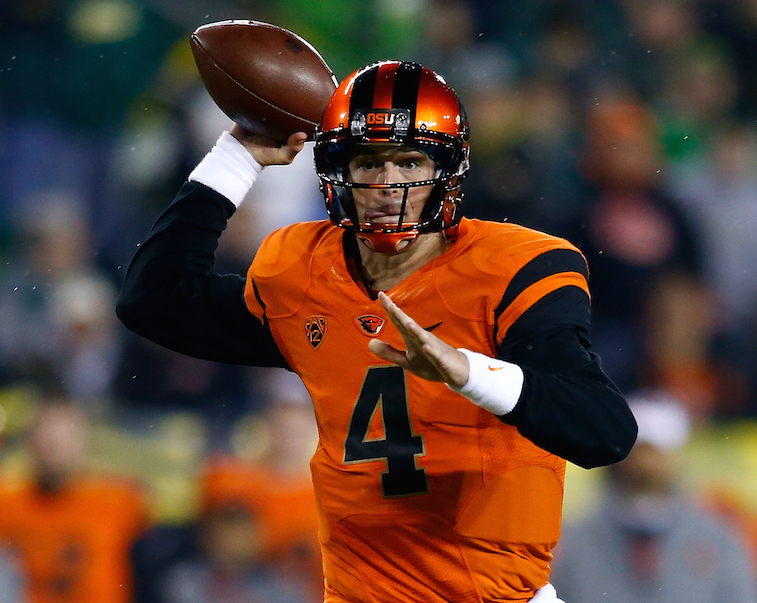 There is a realistic chance that Mannion may end up being the sixth or seventh quarterback taken in the 2015 NFL Draft. With that said, he may actually be the best pure passer available this year. He has the prototypical size and frame that scouts and coaches look for in NFL quarterbacks, and has elite-level arm strength. The one major knock on Mannion is his lack of mobility. With that said, Peyton Manning and Tom Brady both had similar marks against them coming out of college, and both have gone on to have Hall of Fame careers. We’re not saying Mannion is the next Manning or Brady, but his combination of size, throwing ability, and experience in a pro-style system, have us thinking that if he reaches his full NFL potential, he could be a very similar player to Joe Flacco. 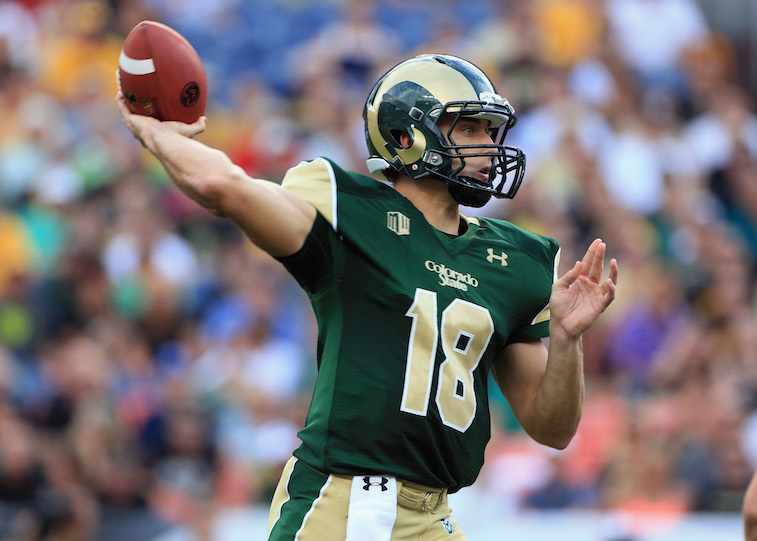 Grayson burst onto the radar of NFL teams after he more than held his own at the Manning Passing Academy in 2014. He doesn’t possess the jaw-dropping, raw arm strength that other quarterbacks in this draft class are blessed with, but he does have enough pop in his arm to make all of the throws necessary for success in the NFL. He is nimble enough to make a few plays with his feet, but will never be mistaken for being the next Michael Vick. His accuracy is also above average, but what may be his biggest strengths are his leadership qualities and his mental aptitude and awareness. After a very strong pro day, Grayson strengthened his case for being the third quarterback selected in the 2015 NFL Draft. If Grayson reaches his full NFL potential, we see him as an Andy Dalton-type of quarterback as a pro. There is no questioning Hundley’s physical ability. He possesses prototypical size, above average speed, and has the arm strength to make every throw an NFL coach could possibly ask him to make. 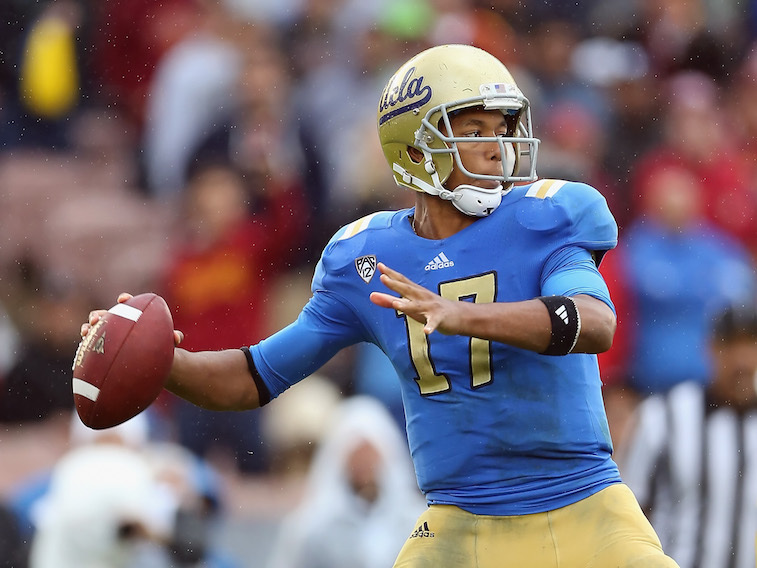 The questions surrounding Hundley heading into the Draft revolve more around his ability to grasp a pro-style offense that will require him to play from under center and make multiple reads. If he proves to be capable of playing in an NFL system, he could be the second coming of Donovan McNabb. If he struggles to adjust to the pro game, he will likely look a lot like Geno Smith. 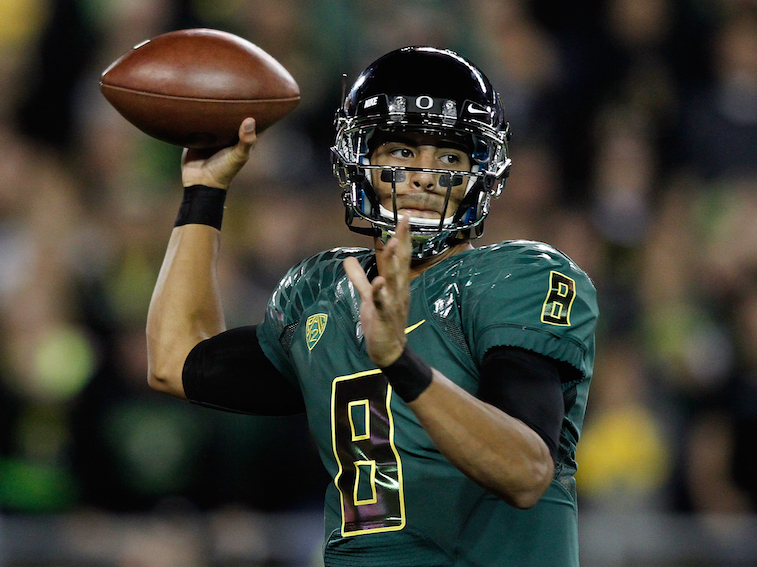 There is very little chance Mariota makes it out of the top 10 picks in the 2015 NFL Draft. In fact, the 2014 Heisman Trophy winner has been so good in his pre-draft workouts and interviews that there are now rumblings around the league that he may go No. 1 overall to the Tampa Bay Buccaneers. As a player with elite speed, and the ability to make every throw on the field from inside or outside of the pocket, Mariota projects to be the ultimate dual-threat quarterback at the NFL level. His football intelligence, work ethic, and leadership qualities are all off the charts. If it weren’t for questions surrounding his ability to transition out of the innovative spread offense that he played in at Oregon, and into a pro-style NFL system, Mariota would be viewed as a can’t-miss type of prospect. His combination of leadership ability, work ethic, and athletic ability have us thinking that he could be a 6-foot-4 version of Russell Wilson if he reaches his full NFL potential. If Jameis Winston had been a model citizen during his time at Florida State, he would rank up there with the likes of John Elway, Peyton Manning, and Andrew Luck as one of the top NFL quarterback prospects to ever come out of the college ranks. He is a polished pocket passer, he has vast experience playing from under center in a pro-style offense, he has the size scouts love to see in a quarterback prospect, his football IQ is elite, he can command an offensive huddle, he has adequate speed for a quarterback and moves well in the pocket, he is passionate and highly competitive, and most importantly, he is a winner. As the likely No. 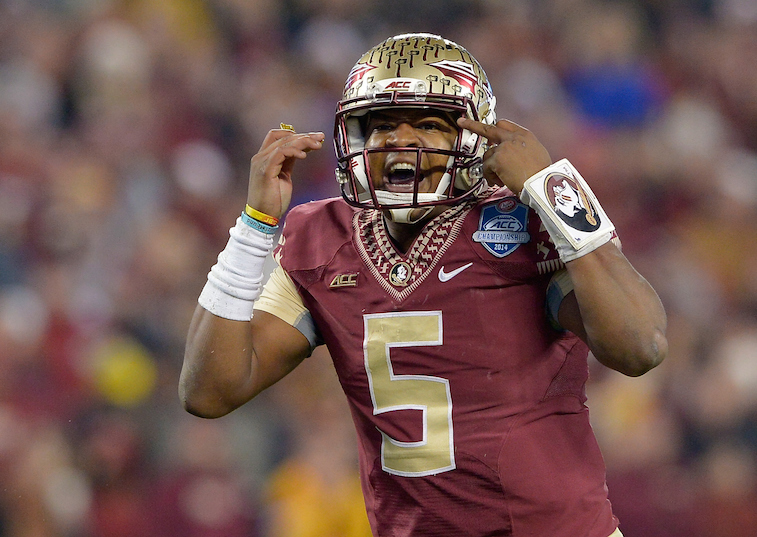 1 overall pick in the Draft, the Tampa Bay Buccaneers will be banking on Winston maturing off the field in a hurry. If he reaches his full NFL potential, we see Winston as a Ben Roethlisberger type of quarterback at the professional level.